ROBO-ONE Light 1st, sponsored ROBO-ONE Committee, took place at Institute of Industrial Promotion Kawasaki Hall on Mar 20th, 2010. ROBO-ONE Light is robot fight tournament for robots on the market, which are officially recognized by ROBO-ONE Committee. Beginner, who got robot from the market and want to attend the ROBO-ONE Tournament, also can attend the competition with his robot which is made from just robot kit. Custom-built robot, just the weight 1 kg or under also be able to attend the tournament. The winner, 2nd and 3rd place robots get the right to attend the 17th ROBO-ONE tournament. Robots on the market, officially recognized by ROBO-ONE Committee, can attend the competition whether the robot adapt the 17th ROBO-ONE regulation or not. Remodeling is prohibited. Head parts can be remodeled and also covering robot body with plastic or paper is permitted. 2) Robot weight except for the officially recognized robot is 1 kg or under and the robot has to adapt the 17th ROBO-ONE regulation. 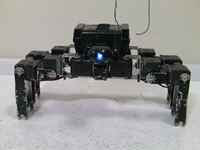 The weight of officially recognized robot such as KHR-3HV is about 1.5 kg. Therefore, custom-built robots handicapped by about 500 g compared with officially recognized ones. It is interesting that how builder of custom robot 1 kg or under overcomes the weight handicap and which robot kit is able to win the tournament. However, it is necessary for getting championship of robot fight tournament to carry 3 important factors such as good body, good motion and good control. Sixty-two robots entered in the tournament, including 20 robots from the Republic of Korea. Six Custom-built robots joined and others were officially recognized ones. The best 16 robots were 5 KHR-3HVs, 5 TINYWAVEs, 4 Bioloids, one JO-ZERO and one UK1 (Alumin). In the 3rd stage, custum-built robot under 1 kg was just Alumin. It seemed the weight of more than 500 g was hard handicap for robot builders. 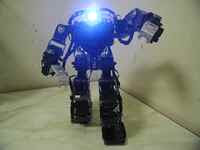 However the most remakable robot of the tournament was MK-09 by maco as follows. It's very cool custum-built robot under 1 kg, however it lost the match in the 1st stage. The best 8 robots were all kit robots such as 4 KHR-3HVs, 2 Bioloids and 2 TINYWAVEs. KHR-3HV is using KRS-2552HV which has high torque, and Bioloid is the most heavy weight robot about 1.8 kg. The winner was fruit (TINYWAVE) by fruit from Korea, the 2nd place was Banboo (KHR-3HV) by Minoru Outsuka, who is famous for robot writer, the 3 rd place was Dolyang (Bioloid) by Do-lyang Kim from Korea. These three robots got the right to attend the 17th ROBO-ONE tournament which will take place at the same place next day on March 21st, 2010. The 3rd palce was Doyand. The champion was fruit and the 2nd place was Banboo. The details are also described in Sanzai Blog and Game Watch by Moriyama.